Germaniae veteris typus - BLAEU, W.
Title : Germaniae veteris typus. Size : 14.8 x 18.7 inches. / 37.6 x 47.5 cm. 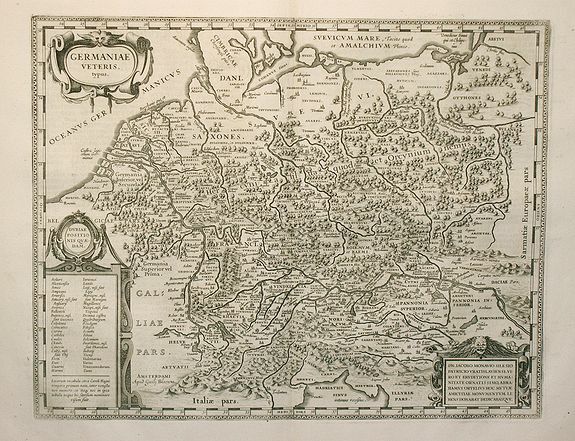 Description :Historical map of Germany concepted after the map of Abraham Ortelius. It shows the area from the North Sea and Baltic Sea in the north to south of the alps and the Adriatic Sea in the south. In the west is Holland and the mouth of the Rhine. In the east is the Weichsel river. The towns and cities from the time of Charles the Great (8-9 centuries) are in the legend in the lower left and especially marked on the map. The plate was engraved by S.Rogiers for Jodocus Hondius. In 1629 Willem Blaeu acquired the copperplate and used the plate in his atlas after altering the address. Condition : A good and dark impression, in mint condition.